How’d you like to take an overseas trip today to tour a charming Swedish villa? You’ll find white interiors paired with warm wood floors that create a cozy, inviting abode. 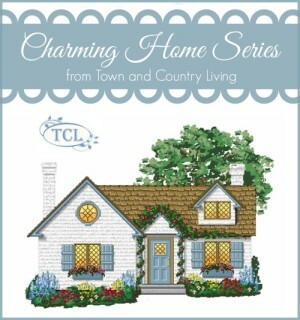 This darling home is by architect Dreams and Coffee AB. Boho chic lanterns populate the living room with its pretty fireplace and bead board walls. They remind me of the lanterns I recently shared on my front porch. Black and white decor is becoming more popular, as you see this color combo used a lot in the show, Fixer Upper. In Sweden when the days are super short during winter, it’s important to have lots of windows to let in natural light. 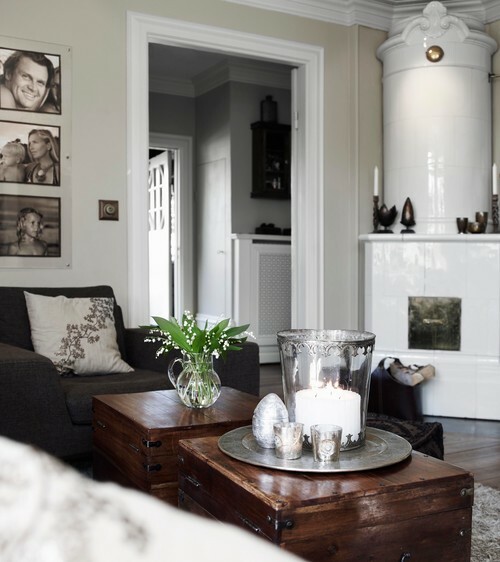 An icon of Scandinavian homes is the Swedish fireplace, which you see in the corner of the living room. 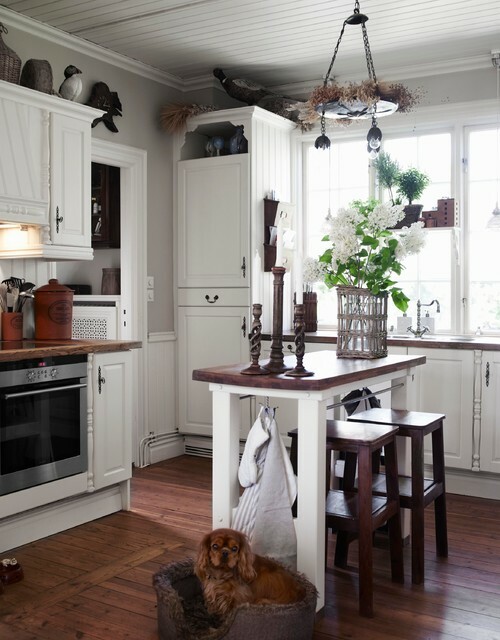 Step inside the kitchen of this Swedish villa and enjoy the custom cabinets and bead board ceiling. A simple kitchen island creates a convenient place for dining. Puppy seems to enjoy his spot in the kitchen. Wood counter tops add an element of warmth to the white kitchen. Did you notice the old-fashioned phone? The dining room features a unique chandelier paired with slip-covered chairs. French doors allow ample light to flood in from the adjoining room. In the bedroom, a shaggy bedspread lends texture and warmth. 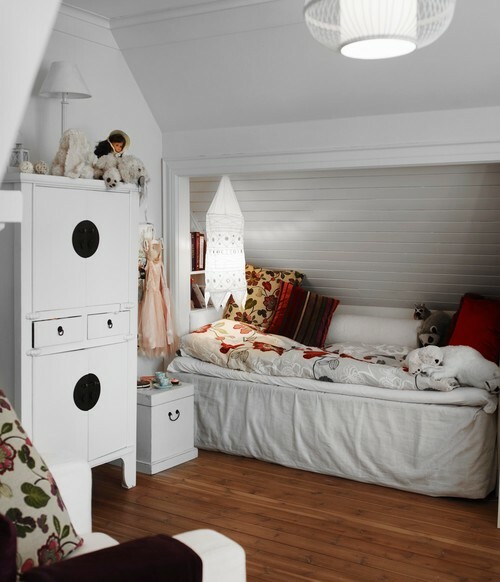 An alcove creates a unique bed for catching some shut-eye. Many Swedish homes have alcoves like this. 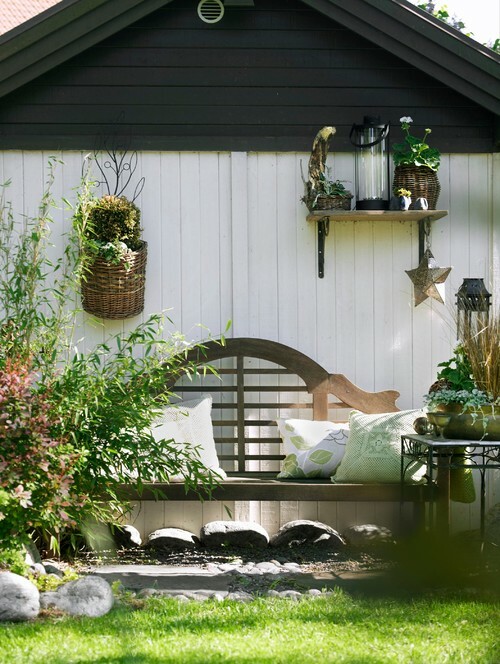 Step outside the Swedish villa and you’ll find pretty outdoor living spaces. A simple bench with plump pillows invites you to take a break from gardening chores. 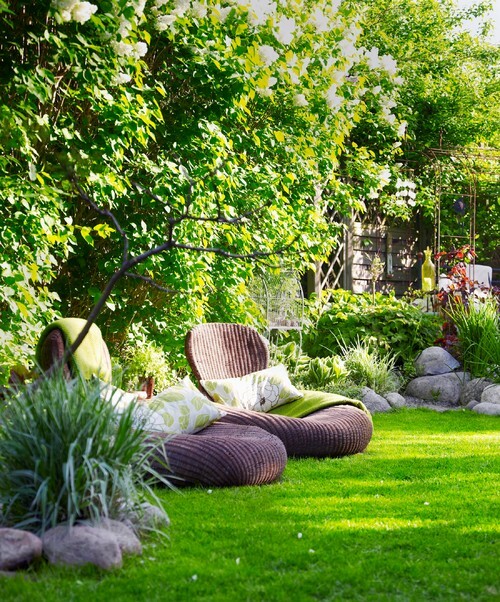 And when you simply want to lounge outdoors, enjoy the sunshine in a pair of comfy lawn chairs. 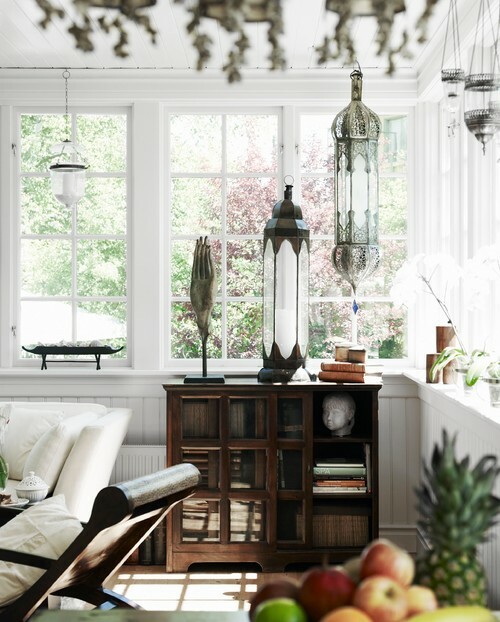 See more of this Swedish villa over at Houzz. I had no idea what Swedish design looked like. 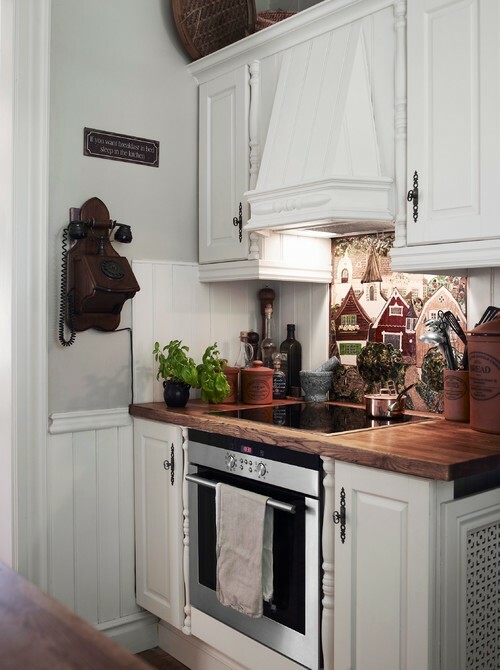 Love that corner stove and the spindle décor around the kitchen cabinets. It adds a lot of character. I love Swedish fireplaces,they are so unique. What a great place to live. The kitchen was a joy and the scene on the back of the stove,so much to look at,thanks for the tour and have a great day. The use of white & ample light makes it very cheerful . I love how they mix new and old elements and it all blends…no cookie cutter designs there. They have such beautiful & unique things that it adds so much interest . What a beautiful home. I could and would live there ! Wow. The outdoor lawn chairs. What a place for a nap. Thanks for the tour and for showing us something a little different.